Each Christmas friends get together for a party and, each year, I bake something spectacular for the table. Last year it was a croquembouche, but this year I was challenged to create some spectacular gingerbread. So, I thought I'd keep it local and base it on a landmark in Brighton, UK, where I live. The Royal Pavilion is an 18th century royal palace in which members of the royal family stayed when not in London. Its design was strongly influenced by an Indian style and makes it really striking in the middle of our city. I managed to simplify the design to a series of boxes and created a central rotunda by baking gingerbread around an empty, clean food can. 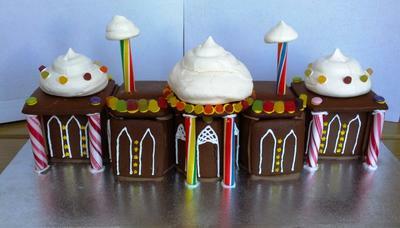 The domes and turrets are meringues.